In April 1974, Christopher Pook, a local Long Beach travel agent and fan of racing, brought international attention to Long Beach by putting the city on the racing map. With the help of 1969 Indianapolis 500 winner Mario Andretti, Pook arranged a Formula 5000 race as a test of the track’s setup. 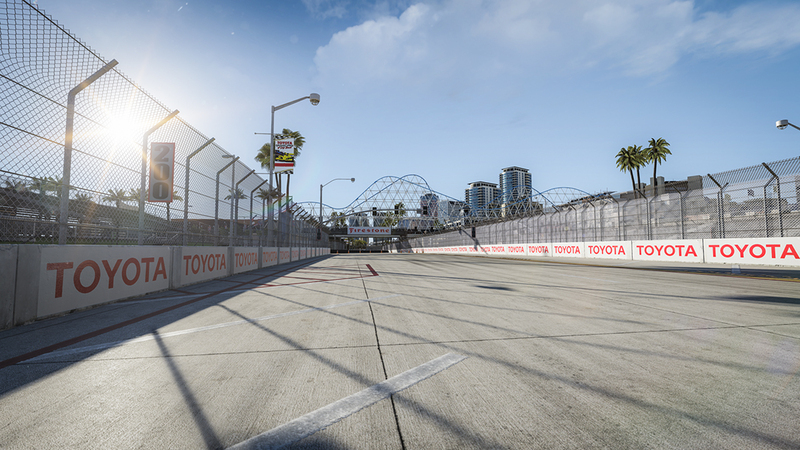 Long Beach went on to host Formula One grand prix during one of the greatest racing eras in history. Drivers like James Hunt, who had a spectacular lap one crash at the circuit immediately gave Long Beach international reverence as the “Monaco of the West.” In 1977, Andretti out-dueled Niki Lauda at Long Beach and became the first American to win a Formula One grand prix in the U.S. Over the years, the skyline of Long Beach has transformed from non-descript, small buildings to state-of-the-art high rises and upscale condominiums. IndyCar racing is now the premier event. Yet, despite these changes, the track has mostly remained the same. Naturally, the street surfaces have improved, but the hairpin just before the high speed run down Shoreline Drive, which leads to the infamous Turn 2 around the fountain, is as challenging as ever. Long Beach is an American racing icon and always provides for exciting racing no matter what breed of cars are competing.